Motorhog Ltd has been charged for breaking environmental laws following a series of enforcement notices from the Environment Agency. 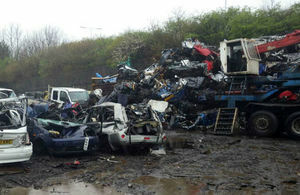 Motorhog Ltd used the now-closed site on Wallsend Road to depollute and bale end of life vehicles, repeatedly breaking the terms of its environmental permit. A Doncaster-based scrap car dismantling and salvage firm has been ordered to pay nearly £25,000 for breaking environmental laws at a site in Tyne & Wear. Motorhog Ltd, which used the now-closed site on Wallsend Road in North Shields, to depollute and bale end of life vehicles, repeatedly broke the terms of its environmental permit. Yesterday (29 November 2017) the company, which continues to operate sites in Leeds, Doncaster and Hull, was fined £20,000 by North Tyneside Magistrates’ Court after pleading guilty to two of three charges. It was also ordered to pay £4,936.88 costs. The prosecution was brought by the Environment Agency after officers spent a significant amount of time attempting, unsuccessfully, to bring the site into compliance. Environment Agency Officers visited the site on 1 December 2015 to assess permit compliance after several breaches were identified during a previous inspection. During the visit they identified further permit breaches, against which they issued two enforcement notices. The first gave Motorhog Ltd until 8 February 2016 to carry out maintenance to the vehicle baler so it could operate without spilling or leaking potentially polluting materials. It also required the company to clean all observed spillages on site and keep appropriate records. The second notice required Motorhog Ltd to either ensure the concrete surface where the vehicle baler operated was compliant with permit requirements or to move the baler to a more suitable area. The firm was given until 11 April 2016 to comply. Environment Agency Officers visited the site again on 2 March and 12 April and noted failure to comply with each of the orders. They also noted unattended spills throughout the site, including fluids visibly leaking from the baler onto the surface below where there was no sealed drainage. I hope that Motorhog Ltd takes a long hard look at its operations across the north to ensure that all its sites are compliant and its staff are properly trained. The regulations exist to protect the environment and local communities from the risk of harm. Vehicles contain liquids that are harmful to the environment and they must be dealt with correctly. We will not hesitate to take action against any operator that repeatedly breaks the law and disregards its environmental obligations.